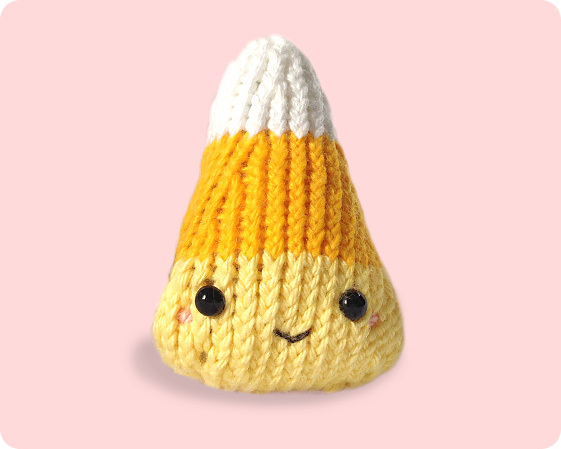 FREE Halloween Candy Corn Easy / Intermediate Knit Pattern! Knitting patterns are available in both Easy & Intermediate version. Halloween is a month away, and there is no better time to start preparing some handmade zero calories candy treats! If you come to this page from the home banner, you will notice that these candy corns have no wings attached. Yes, unfortunately no wings this time… my original wings knitting pattern is coming in the next post. 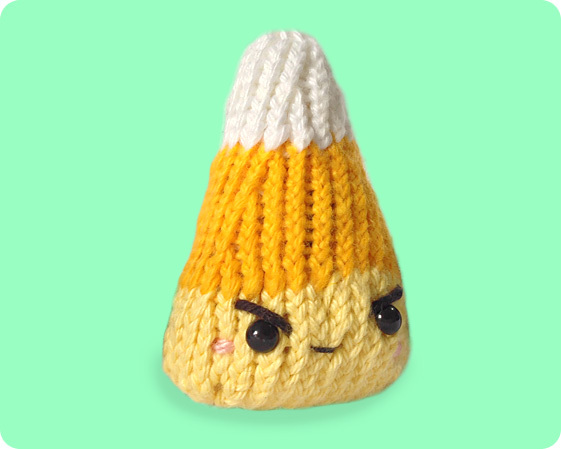 Once they are ready I will share them with you 🙂 In the meantime, please enjoy the free candy corn pattern to get you started! The easy candy corn knitting pattern is designed by Crafty Alien and you can find it HERE. Crafty Alien has kindly converted their crochet pattern into knitting patterns and you can easily knit these candy corn with straight knitting needles. Two most hardest skills in the pattern are M1 and SSK. I have previously attached both video tutorials on M1 and SSK in my free pig pattern post. On the other hand, if you are looking for more challenge and wish to knit in the round, I have provided the pattern conversion below. with a set of 4 DPN needles and Yellow Yarn, CO 18 sts. Place 6 sts on each 3 DPN. Being careful not to twist. Cut yarn, leaving approx. 10cm tail, thread through the loop and pull tight to close the hole. Seam the yarn inside to secure. By this stage, I seamed all the other cast on & end tails to tidy up, and leaving the last Yellow cast on thread for closing up later on. Now, comes the face embroidery time! I personally use 6mm black safety eyes, but if you are making this for a baby, please embroidery the eyes instead. (DPN) double pointed needles, baby toys, candy stuffed toys, cute amigurumi toys, easy knitting patterns, face embroidery, free knitting patterns, halloween gift, intermediate knitting patterns, kid toys, knitted food, knitted toys, small stuffed toy, straight needles. Bookmark. This is so adorable! Love the work! Thanks for sharing!